To download our Bay Score card please click here. From 1st March our Summer charges will apply – Please view our Summer Charges here. New in 2018, we now play the stunning 18 hole golf course at the Bridlington Links on either the Heritage course (Typically Tuesday, Wednesday, Thursday and Friday) or on the Bay course (Typically Saturday, Sunday and Monday). For more information on the set up of these courses, please download the score cards and course maps. Bridlington Links Golf & Leisure Estate boasts a challenging 6719 yard golf course of competition tees (6304 yards of yellow tees and 5660 yards of red tees) with a distinctive “links feel” and breath-taking views of Bridlington Bay and the town. The par 72 course offers spectacular holes along the cliff tops and Danes Dyke and is a challenge to all levels of golfer. This is one of our signature holes. The trick here is to play towards the pond trying to drop just in front or ideally just beyond it. You’re next shot is equally challenging with another pond positioned just to your right. We recommend that you try to avoid this! This is a real “Brid Links Special”. If you’re not on form – bring a snorkel! This hole has seen considerable upgrading with a new back tee increasing the length to 177 yards. Another challenging one with a seemingly simple priority on your tee shot of avoiding the bunkers. Do this and par isn’t out of the question. But, of course, you do have to tackle the other feature of this hole, the two tier “Mackenzie Green”. Off the tee, aim to hit the shot around 200 yards which should settle you nicely in front of the pond. Hopefully, your next shot will take you over the water leaving you nicely placed for the green. Sounds easy, but this is generally viewed as the sixth toughest hole on the course and a challenge for all level of golfers. With an unremitting wind that comes swirling over the east coast cliff tops, this 411 yard hole can really test your metal! It offers an ominous start, with the likelihood of playing into the wind with a tee off into the unknown as the ball lands in a wicked dip. Ideally you want to be landing the ball between the two bunkers so your best approach is to “scuttle” a low drive beneath the prevailing winds. If all goes well you should be well placed to aim for the middle of the green. However, be very careful – go left or long and your ball could well end up in a fishing coble! A great chance to see off the worst the Yorkshire coast can throw at you! This is a claustrophobic, leafy, enclosed hole that’s full of character and deceptively long at 400 yards. Thread the ball through the banks of trees hitting 240-250 yards off the tee. That should leave you with a medium iron to the red flag which you will have to address slightly blind. Watch out for the hidden pond on the left-hand side before the green, that transgresses onto the fairway. This is a great hole that has a double joining fairway with the 10th and plenty of “clatterers” against the trees in the infamous “Geoff’s Wood”! Par 29 short course, our picturesque 9 hole short course is ideal if you’d like to try golf for the very first time, improve your game or fine tune your skills. It’s very popular with beginners and casual golfers alike whilst our practice area offers everything that a new or established golfer would need for honing skills and preparing for the challenge of the main course. 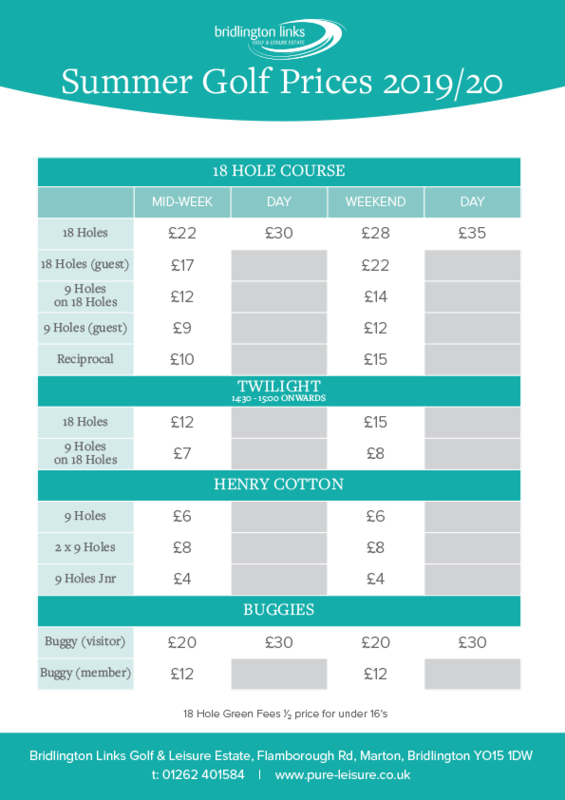 The cost of play is £6 for 9 holes or £8 for 18 holes, 2 rounds. We have a relaxed dress code on this course. Hitting golf balls is a fantastic form of exercise and great fun for all the family. You don’t need to have played golf before or be a club member to use our driving range and we can provide both clubs and balls. Unlike other activities the range is undercover so even if the weather is wet, you can still enjoy a little fresh air and exercise! 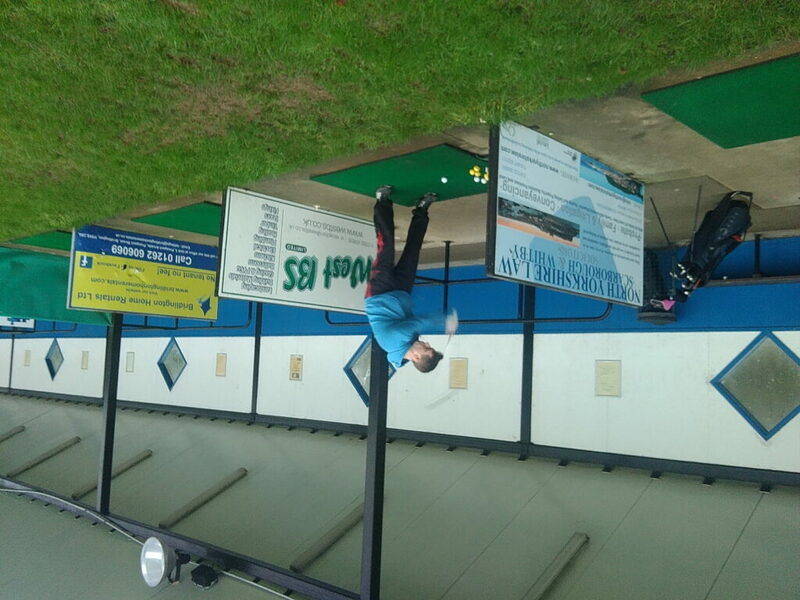 Bridlington Links Golf & Leisure Estate driving range is floodlit, with 20 bays, including a specific teaching bay. Set in beautiful woodland, the undercover, floodlit driving range at Bridlington Links Golf & Leisure Estate is open every day of the week for everyone from complete beginners to experienced golfers to work on their game. In winter opening times are from 8.00 am till dark 7 days a week. Additionally, the floodlights will be activated on Tuesdays and Thursdays until 8.00 pm and Saturdays until 5.30 pm during the winter period. These facilities are open to the general public also and costs £1 per 25 golf balls. If you require any further information please contact the Pro shop on 01262 411660.